With Christmas packed in boxes and stored away for next year I wanted to look at a different colour scheme for my new crazy quilt. It didn’t need to be red and green! There are elements from Natalie’s wedding day, Harriet, Graced in Petals, Marianne, Amore Grunge and Le bebe Royale. 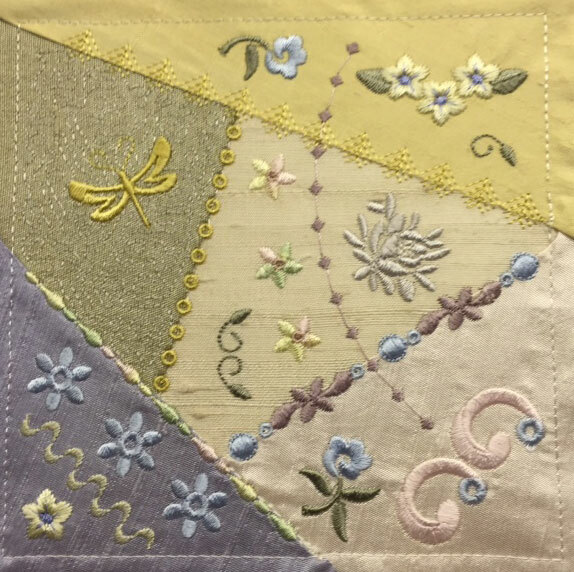 I have also added some lovely heirloom embroidery stitches but there is lots of room for embellishment to make it your own unique block! These colours were picked at random as I stitched the block out, but I was disappointed with the grape colour but hopefully the right embellishment will tone this down. Not sure about the orange leaves either. I made a mistake in my block not using a large enough pale blue fabric in the top left. Rather than doing it again I thought I would leave it so I can repair it by carefully adding the right embellishment. We all make mistakes and I thought you’d like me to share mine with you! The strippling on this section is quite dense so it will change the look of your fabric. Watch out for part 2 to see my repairs. For the smaller block the process was not so random. 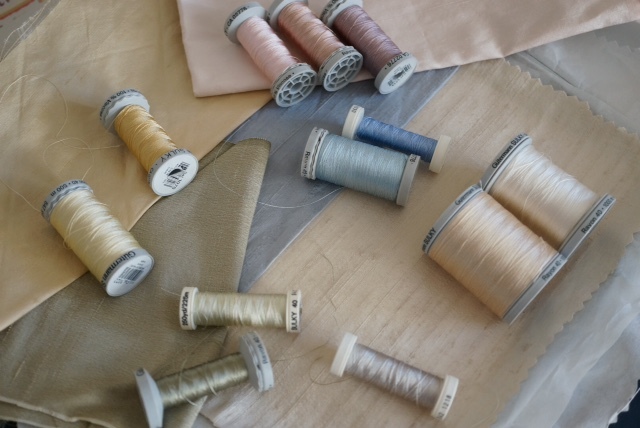 I selected a coarse cream silk for my base fabric. Then I found small remnants of silk which looked good together, palest pink, pale wedgewood blue, pale gold and a light moss green. Then I found embroidery thread colours to co-ordinate with these colours. Notice how I have selected slightly darker shades for each fabric. Here is the second block ready to be embellished. Needless to say I was disappointed with the variegated thread. In the back of my mind I am trying to decide how to use all these pretty blocks. Perhaps a beautiful bag should be my first project but I would have to be careful what sort of embellishment I use as it must be tough! 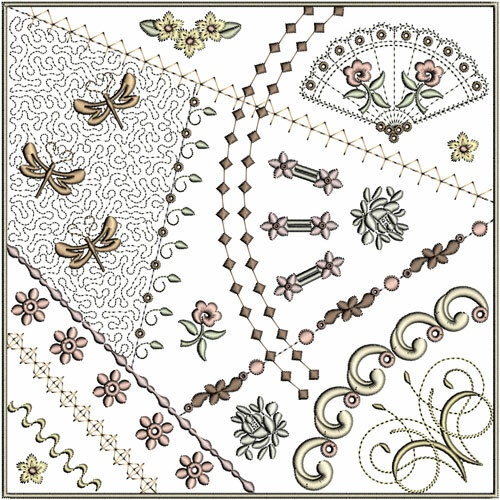 This Romantic Crazy Quilt block will be released on January 6th, 2015. Back soon when the blocks are embellished. This entry was posted in Announcements and tagged Embellishment. Bookmark the permalink. They’re beautiful. I never cared for crazy quilts but after seeing yours I’m a big fan. Happy New Year Hazel! I really appreciate that. I hope will like any new ones I produce too! I am currently working on one for Valentines but it appears to be developing into two instead!! LOL! I love the blend of colours you are using. As always, just outstanding work. I love the colors you choose. You have done a wonderful job. 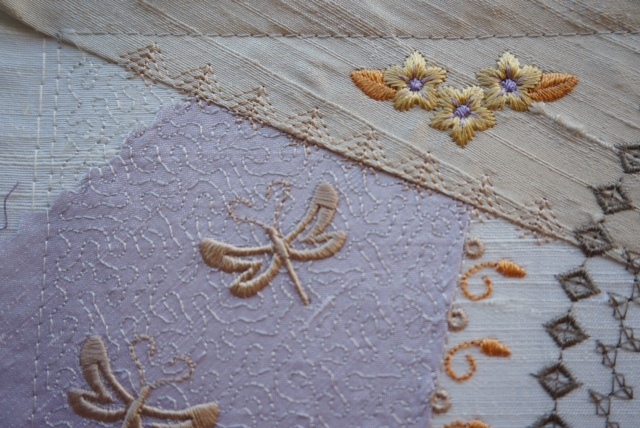 The designs look pretty as the colors of thread you have used in the block are matching well with the fabric. Especially, the golden color is giving a fabulous look to the design. Beautiful, Hazel! 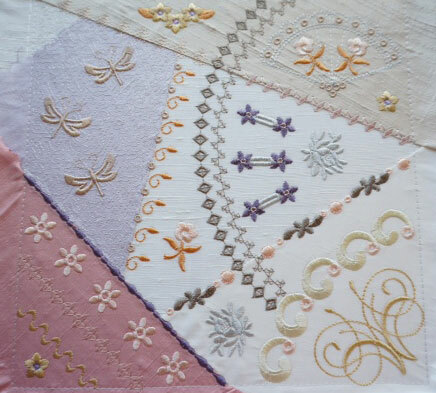 Cannot wait to see these beautiful quilt squares.